USDA Forest Service Interim Chief Vicki Christiansen, left, talks about a new forest management plan announced by the Agriculture Department on Thursday. 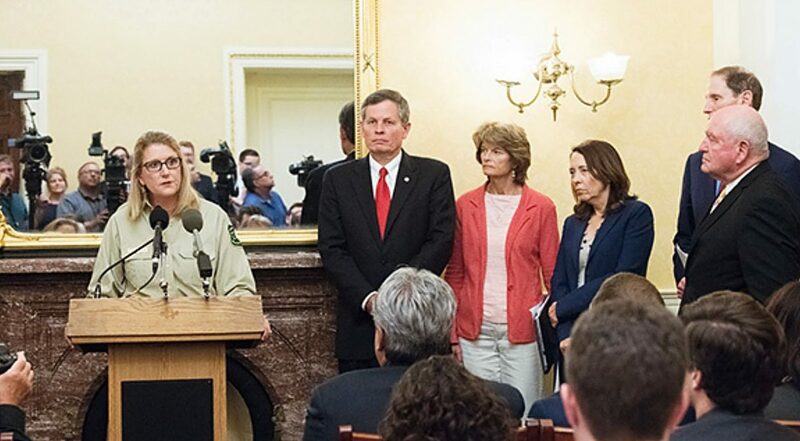 Also at the event, from left, were Sen. Steve Daines, R-Mont. ; Sen. Lisa Murkowski, R-Alaska; Sen. Maria Cantwell, D-Wash.; Sen. Ron Wyden, D-Ore., and Agriculture Secretary Sonny Perdue. Agriculture Secretary Sonny Perdue on Thursday announced a new forest health strategy in the wake of his trip to California this week to see damage caused by wildfires. "I saw the devastation that these unprecedented wildfires are having on our neighbors, friends and families," Perdue said in a news release after an event in the Capitol. "We commit to work more closely with the states to reduce the frequency and severity of wildfires. We commit to strengthening the stewardship of public and private lands. This report outlines our strategy and intent to help one another prevent wildfire from reaching this level." "Both federal and private managers of forest land face a range of urgent challenges, among them catastrophic wildfires, invasive species, degraded watersheds, and epidemics of forest insects and disease," USDA said, noting that "the conditions fueling these circumstances are not improving." Of particular concern are longer fire seasons, the rising size and severity of wildfires, and the expanding risk to communities, natural resources, and firefighters, USDA said. 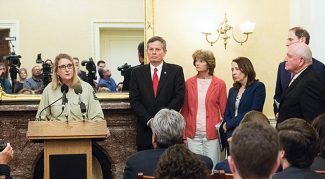 "The challenges before us require a new approach," said Interim U.S. Forest Service Chief Vicki Christiansen. "This year Congress has given us new opportunities to stand shoulder-to-shoulder with state leaders mitigate to identify land management priorities that include mitigating wildfire risks," Christiansen said. "We will use all the tools available to us to reduce hazardous fuels, including mechanical treatments, prescribed fire, and unplanned fire in the right place at the right time, to mitigate them." The new plan is contained in a report USDA released Thursday. Prioritizing investment decisions on forest treatments in coordination with states using advanced science tools. "This allows the USFS to increase the scope and scale of critical forest treatments that protect communities and create resilient forests." Building upon the authorities created by the 2018 omnibus bill, including new categorical exclusions for land treatments to improve forest conditions, new road maintenance authorities, and longer stewardship contracting in strategic areas. Continuing streamlining of internal processes to make environmental analysis more efficient and timber sale contracts more flexible. Emphasizing the Forest Service's commitment to a risk-based response to wildfire in order to minimize firefighter fatalities.